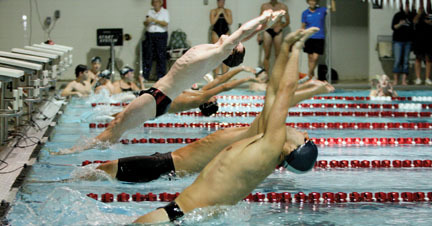 Garnet male swimming captain Douglas Gilchrist-Scott (third from front) won seven medals at the Centennial Conference Championships and broke five records. Men’s swimming (second at CC Championships) Senior Douglas Gilchrist-Scott collected seven medals at the Conference Championship meet, breaking a 12-year-old Conference and championship meet record (along with his own school mark) with a 46.48 time during the preliminaries of the 100-yard freestyle. He went on to earn a bronze medal in the event, clocking in at 47.20 during the finals. Gilchrist-Scott also set a school record in the 50-yard backstroke (24.66) as the lead leg in the silver-medal 200-yard medley and another new mark in the 50-yard freestyle (21.39), earning bronze medals in the 50-yard free and the 100-yard backstroke. 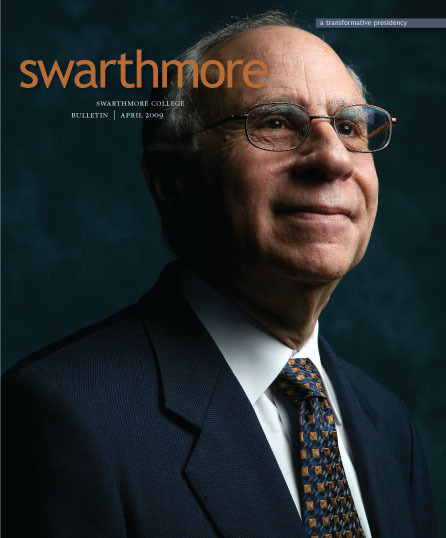 Gilchrist-Scott also played an important role on the Swarthmore relay squads, which brought home three silver medals and one bronze. His anchor leg in the 400-yard medley relay capped a school-record performance (3:32.02) that included teammates Santiago Lombo ’11, Sterling Satterfield ’11, and Sam Bullard-Sisken ’12. Gilchrist-Scott led off the 200-medley relay squad of Satterfield, Bullard-Sisken and freshman Tim Brevart, and he was part of the school-record–breaking 400-yard freestyle relay team—along with Michael Ahn ’10, Neil Palmer ’12, and Brévart—that earned a silver medal. The aforementioned 200-yard free relay team—with the quartet of Gilchrist-Scott, Brévart, Lance Liu ’12, and Ahn—also medaled, collecting a bronze. Long distance freestyler Stephen Shymon ’09 brought home a pair of gold medals, winning the 500-yard freestyle and breaking the his own school record in a time of 4:41.03 and then swimming to a seemingly effortless victory in the 1,650-yard freestyle (16:31.72). The dynamite breaststroke duo of Liu and Satterfield posted new College records, both achieving NCAA B-cut times (times that don’t automatically but may qualify for participation at the national championship), in the 100- and 200-yard breaststroke events, respectively. Liu collected a silver medal in the 100-yards, posting 58.30 (a school record), and Satterfield earned a bronze with a post of 59.04. Satterfield swam 2:07.46 in the 200-yard breaststroke preliminaries and then lowered the time (2:06.98) in the finals, earning a silver medal. Kim Kramer won three consecutive singles and doubles titles at the Pennsylvania State Open. Placing 13th in the National Women’s Singles rankings, she was invited by USA Badminton to travel to Iran as part of a goodwill venture in January. Badminton (4-4) Kim Kramer ’10, 13th in the national women’s singles rankings, was invited by USA Badminton to travel to Iran as part of a good-will venture in January. Kramer has secured three consecutive singles and doubles titles at the Pennsylvania State Open, combining with teammate Maithili Parikh ’11 to create one of the most formidable badminton duos in the nation. They reached the semifinals of the women’s doubles tournament in the Mid-Atlantic Classic before falling to top-seeded Daphne Chang and Mingzi Zhang. Men’s basketball (3-21, 2-15 CC) The Garnet finished the 2008–2009 season looking strong. They posted victories over Conference playoff teams Gettysburg (an NCAA Tournament participant) and Washington College in the final month of the season. Swarthmore senior forward Raul Ordoñez led the squad with 12.7 points and 8.3 rebounds per game, (third in the Centennial) tying the program record with 22 drawn charges. 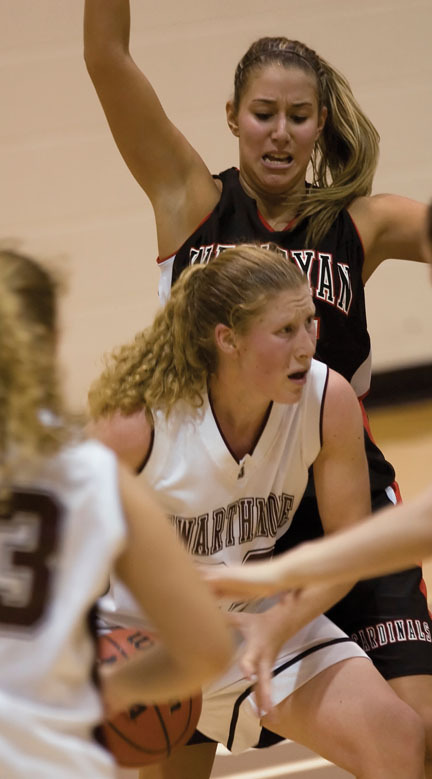 Kathryn Stockbower was one of 42 players in the country to be named a finalist for the 2009 State Farm Coaches’ All-America Basketball Team. Women’s basketball (13-12, 10-8 CC) Sophomore forward Kathryn Stockbower, one of 42 players in the country to be named a finalist for the 2009 State Farm Coaches’ All-America Basketball Team, led the Centennial Conference in scoring (17.7 points per game) and rebounding (13.6 per game), and was named the Conference Player of the Year. A unanimous First-Team selection, Stockbower tied the conference mark (and broke the school mark set by Nancy Rosenbaum ’96) with 24 rebounds at McDaniel. She also broke a conference record by hitting double figures in scoring for 47 consecutive games, receiving five Player of the Week honors. Garnet senior captain Melissa Grigsby joined Stockbower on the All-Centennial team, earning honorable mention after handing out 3.7 assists per game (top-10 in the Conference) while making 88.4 percent of her free throws. Grigsby made a stirring exit on Senior Night at Tarble Pavilion, scoring a career-high 22 points in a win over Washington. Indoor track-and-field (women 7th, men 9th at CC Championships) Senior Caitlin Mullarkey became the fourth female in Swarthmore history to earn All-America for indoor track-and-field, finishing fifth in the mile run at the NCAA Division III indoor championships in Terre Haute, Ind. Mullarkey qualified for the national meet by breaking the school record in the mile run at the E.C.A.C. Division III Championships on March 7, recording a time of 4:59.54—the eighth-best in all of Division III. Freshman hurdler Kenyetta Givans missed a gold medal in the 55-meter event at the Conference Championships by two one-hundreths of a second. Her time of 8.575 broke the school record of 8.71 set by Catherine Lane in 1997. The women’s distance medley relay team of Nyika Corbett ’10, Givans, Natalie Stone ’09, and Mullarkey earned a bronze medal at the Conference Championships. Senior Dan Hodson joined Mullarkey in being named Conference Co-Indoor Track-and-Field Athlete of the Week on Jan. 13 after winning the mile at the Delaware Winter Invitational.